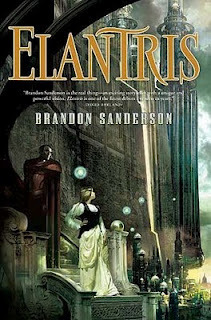 I finished reading Elantris by Brandon Sanderson about week ago. In order to catch up I'll try to keep this review short. This was Sanderson's first novel, and it really shows. It's not bad, but having read the Mistborn books I can see he's come a long way since. If you particularly want to read his works and haven't started yet, give this one a go first. You'll probably enjoy it more that way. The premise of this book is great - the once godlike are now akin to lepers. Characters were pleasantly multi-dimensional, at least for the most part. Good and evil were not clearly defined though some were a lot greyer than others. One or two characters bugged me - one too perfect, the other almost comedically evil - a little but I liked that the primary antagonist wasn't acting on "evil" motives. Even the nastiest of characters showed a human side, if only briefly. The exploration of the magic system through the main characters' discoveries that was seen in Mistborn is here too. The main difference is that in Mistborn things tended to dawn on the main characters as you worked them out for yourself. Here some of them were clear a mile off, and the supposed genius of the characters was blindingly obvious well ahead of time. And the ending was also always going to be the way it was. It was clear very early on how things had to resolve - it was just a matter of how the story got there. To sum up, Elantris is enjoyable enough and showed the promise that Brandon Sanderson has come good on later on - this book, while very good by general fantasy standards, just isn't up to the standard of his later works.